Let's start off with some fun facts! 25 countries were represented at today's race. 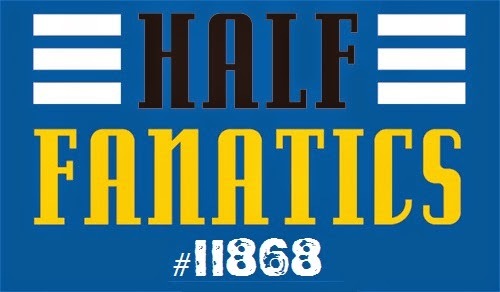 80% of the runners were from the Austin/central Texas area. 20,000 gallons of Gatorade and 30 lbs of petroleum jelly were used. And I saw a guy who's name on his bib was "BoomBoom." Obviously, the professional/official photos are not available yet. I will be buying some, but not right when they're available...I'm going to wait until they offer the 3 digital downloads for the price of 1 like I did with the RNR half. But, when the official pictures are published online, I will screenshot the ones I like and plan to buy and post them on here. 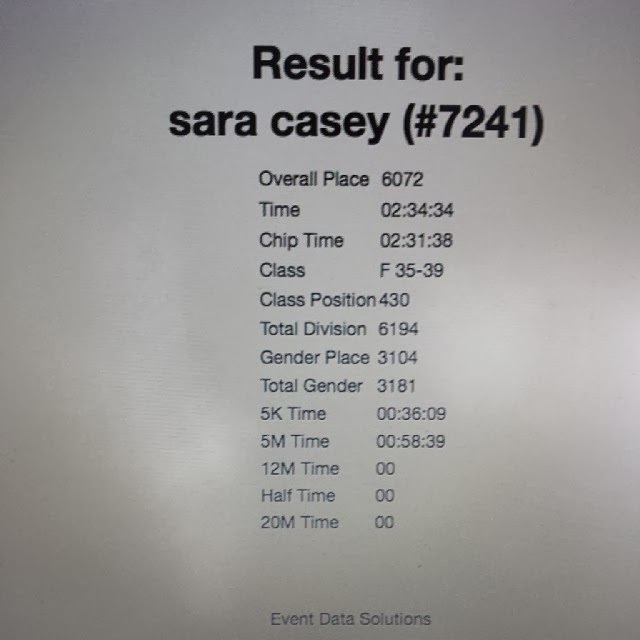 Since I shuffled my way through the half at the RNR in San Antonio back in November with a finishing time of 2:51, I was pretty much set for a PR with this half. And I did. By 20 minutes. I finished in 2:31. So, I got to get a picture of me ringing the PR gong at the finish line! YAY! Okay, here's the report. Since I work in downtown Austin, I just parked at my work in our parking garage to avoid traffic drama/mania/panic. It was a 3/4 mile walk to the start line from where I parked. So, a nice little warm up walk...especially since I forgot to do my normal pre-run warmup of leg swings and calf raises. Last night I went to the store and bought myself a large blueberry bagel and a banana to eat pre-race today. Plus, I had a travel cup of coffee from the other day that I drank down. I forgot to bring a small bottle of water to chug at the start to make sure I started off hydrated. Oh well. I also did something I have never done before for a race...I know...racing no-no. I've been fairly "regular" (if you know what I mean) lately and I didn't have to go at any point before the race this morning, so I stopped and bought some generic Immodium to make sure I didn't have any accidents or long waits for the port-a-potty impacting my race time. It worked...so success! The race started promptly at 7am. 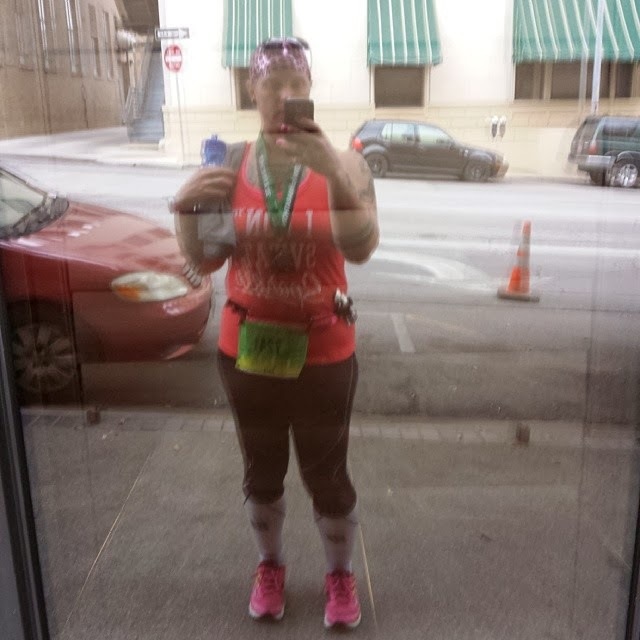 I did not start where I was "supposed" to, which, with a half marathon goal time of 2:41 or less would have been waaaaaaaaay in the back with the 5:00 hr marathon pace group start corral. I think I positioned myself around the 3:45 corral. I may "cheat" at the start line, but I stay to the right so I'm easy to pass for the [much] faster runners. There wasn't a lot of start line congestion and I made it to the timing pad within about 3 minutes of the gun time. There was the standard general congestion for the first mile or so, but it really wasn't too bad. It was easy to maneuver my way around people for the most part. My coworker I ran into at the expo yesterday, Dion, warned me about the hills. They're all over the place in this race, the worst 2 being in the last 1.5 miles of the race. OMG! 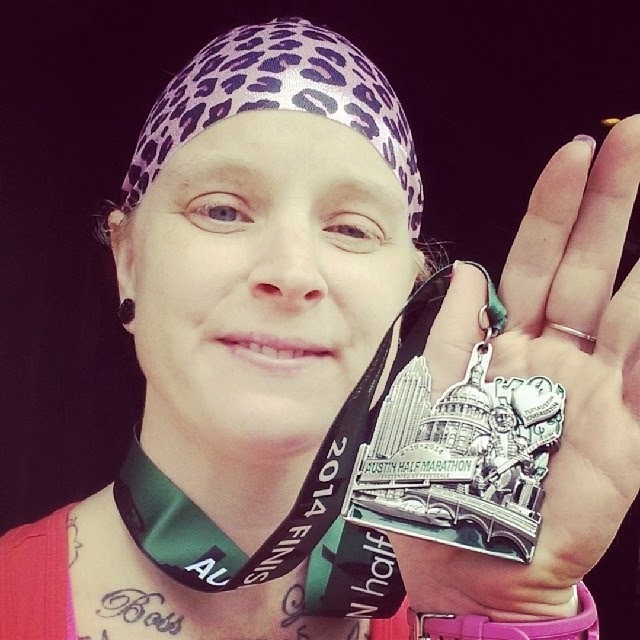 I went into this race with a general understanding and deal with myself that I would take somewhat structured/regular walk breaks to make sure I didn't end the race doing the shuffle for the last 2 miles like I did at the RNR half. Unlike the RNR, I never hit the "wall." I had originally thought I would walk for a minute at every mile mark, but that's not what happened. No one was doing any walking yet at the first mile, so I just kept on going. I took my first walk break at the first water stop at mile 1.8-ish. The first 3 water stops, I grabbed some Gatorade AND water. After that, I was a little selective about grabbing fluids. I didn't want to overdo it. I mean, on my last long training run of 11.2 miles, I didn't drink ANY fluids during the entire run even though I had a bottle with me...I just wasn't thirsty. Since I haven't been taking in a lot of fluids during a run in training, I didn't want to confuse my body by taking in a bunch of fluids today. I had taken 2 AccelGels with me for the race (the 2 that I scored as handout samples from the expo yesterday!) and only ate one...at mile 7. 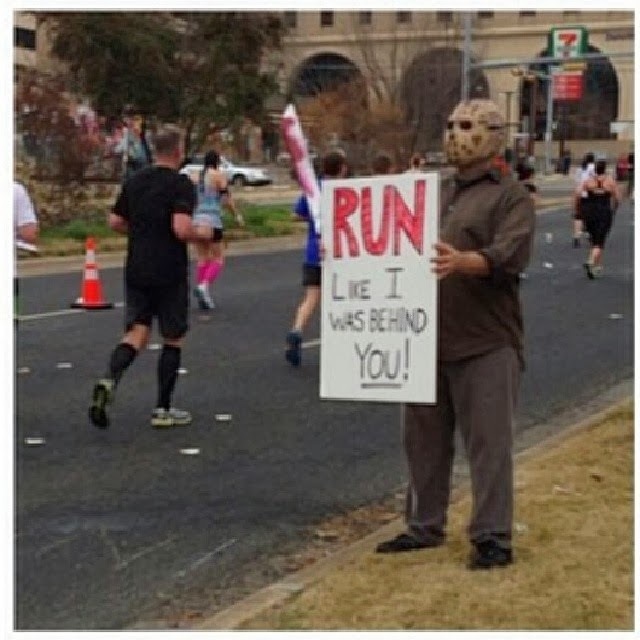 • "should have taken a dump while you had the chance"
• "Sunday funday you're doing it wrong"
• a guy dressed as Jason with a "blood" covered plastic machete holding a sign that said "RUN like I was behind you!" 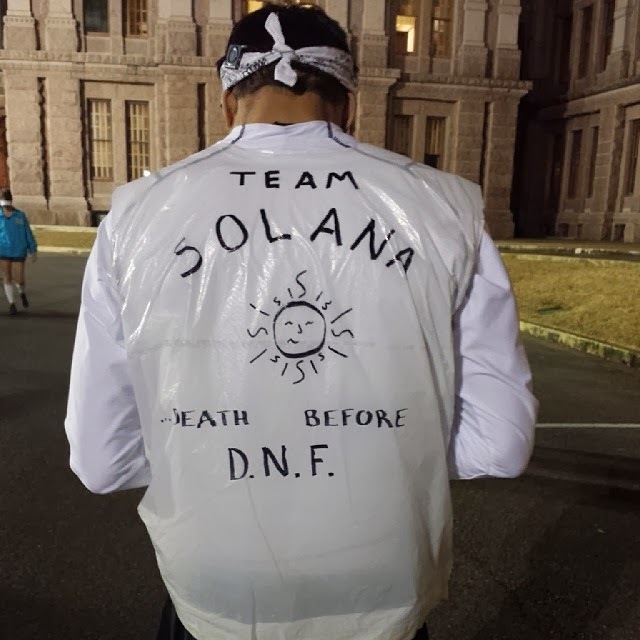 • not a sign, but a guy's garbage bag to keep himself warm pre-race that said "death before DNF"
Okay, you know how at some of the later water stops they hand out petroleum jelly on tongue depressors? You know how most volunteers will yell out "petroleum jelly! not for eating!" as they hand it to you? Well, there were quite a few people from Japan, so their English was probably not all that great. I say this because I watched a Japanese guy EAT the petroleum jelly. GROSS!!! Another note with the p.j. is that this is the first time I've used it during a race. I know it's because my shirt was cotton and not a tech shirt, because it happened under my biceps right where my arms rub against the underarm part of my shirt. The 2 worst hills were in the last 1.5 miles of the half. But, I powered through them with strategic walking, so it was all good. One good thing about wearing a shirt that says something fun on it like my shirt ("I don't sweat I sparkle") is that spectators will single you out and cheer for you. On more than one occasion, someone hollared out something about "you got this, Sparkle!" or "you're doing great, Sparkle!" Also, a plus to having your name on your bib and having a habit of running to the far right is that spectators can read your bib as you run by and cheer for you by name! And 2 people did just that. It felt great to have someone personally cheering for me, even thought I didn't have any friends or family within the spectators. I ran without music again. I think I've figured it out. If it's a big race that will have a lot of participants, I won't wear music because it makes me feel more a part of the group and enjoy the experience more. If it's a smaller race with not very many participants (for instance, the Brown Santa 5K), I will wear music because I find myself to be incredibly bored during races where I'm not running in a big herd of people. The finish area was great. I got my medal almost immediately after crossing the finish line. I was able to grab a bottle of water to chug, 2 mini bagels, the most delicious oatmeal cookie I've ever eaten, a banana, and a bag of generic Frito's. I have to say, I think my favorite post-race food is Frito's (or a generic version). The only thing I would have wished for that wasn't there was some chocolate milk. Maybe next time I'll do gear check and stash a bottle of chocolate milk in there. After raiding the food, I hit up the PR gong photo op, then made my way toward the gear check/finisher shirt pickup tent. I got my shirt and then wandered the rest of the post-race area. They even had a tent with laptops set up to search your results. I found the massage tent, only to find out that they weren't free 5-minute massages but 20-minutes for $20 massages. I didn't have any cash on me, so I was S.O.L. on a massage. I then made my way back to my car. On the way, I made sure to stretch out my calves and hamstrings to hopefully keep my legs from seizing up on the drive home. It worked. When I got home, I finished up my stretching and did my IT band foam rolling, then hit the shower. After I showered and got some yummy food in my system, I went to the website and looked up the official results. 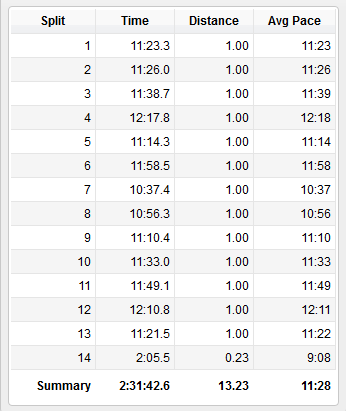 I think if the course hadn't been so hilly, I could have easily have gone about 3-4 minutes faster on my finish time. But I'm more than happy with my finish time. I shaved 20 minutes off my previous half finish time and that's awesome. I'm not too happy with the muted colors they used, hard to see. 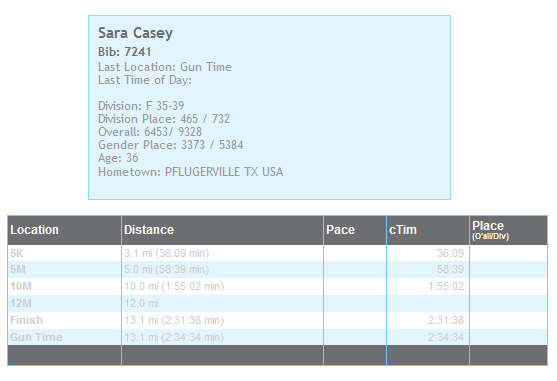 With these results, I can set a goal time for the Austin 10/20 (a 10 mile race) based on what I hit the 10 mile mark during this race. I hit it at 1:55 hrs. 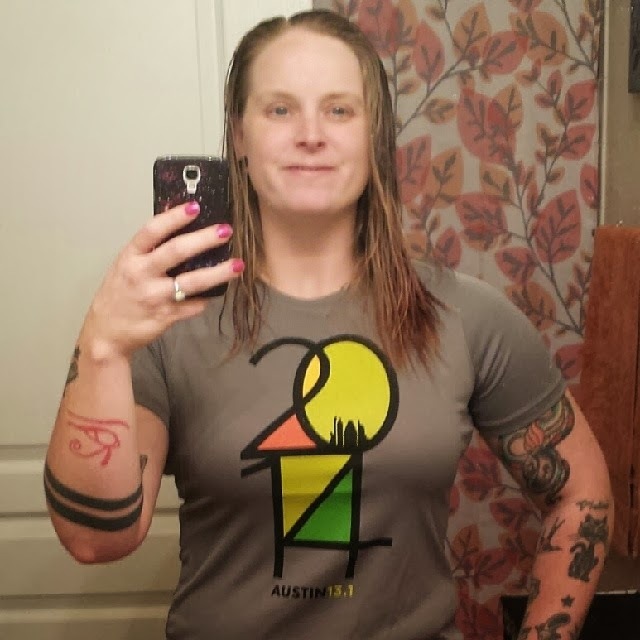 So, I'll set a goal time for the Austin 10/20 of 1:52. That sounds good to me. 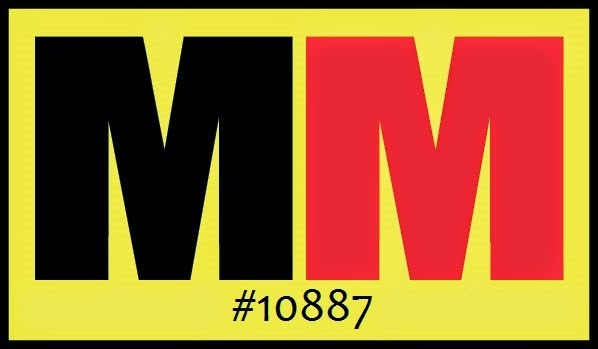 I did just notice that there's no 10K time listed. Hmmm. Weird because there was a timing set up at the 10K mark. Anyway, I'm super happy with this race and I look forward to doing it again next year. Nice job! Congrats on the new PR, esp on hills! I love the generic Fritos too. My training routine is to go for Mexican food after every 20 mile or longer training run because the salt on the chips is so good for getting me back to normal, the Fritos work too. my original post-race meal idea was to hit up my favorite Mexican restaurant for some smothered beef fajitas. I didn't do that and now I'm having issues remembering what I did go eat...haha. must not have been very exciting, huh? I think the next long race I do, I'll do a gear check with some chocolate milk and Frito's in the bag. haha!